A few weeks ago we were down at the beach near Enoshima, where it was the closing hanabi of the Summer festival season – yes, in October. I think it’s one of the last formal fireworks events in Shonan for the year, and it attracted several thousand people, on the beach and the strip of grass and parks between the beach and the main coastal road. The whole thing went for just under an hour, a little longer than normal, but not as long as some of the big ones around Japan. The atmosphere was great though; there’s just something relaxing about being down by the beach, sitting around and watching fireworks – and quite a few people were finishing off BBQs. When the fireworks finished, in an impressive finale, there was a generous round of applause. It was also good that had quite a few designs I hadn’t seen before, and there were fewer ‘character’ based ones like Doraemon, which I find a little cheap. I should say, I’m awful at taking pictures of fireworks, mainly because I’m, you know, busy watching them instead of getting the camera right. 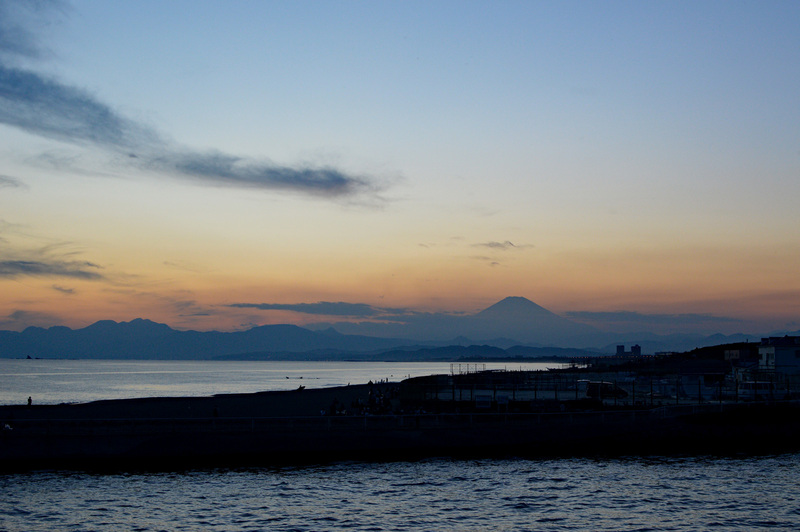 Instead of a shakey and blurry picture of fireworks then, I thought I’d put in an equally generic photo of sunset around Fuji from Enoshima I took as we were waiting, and a short video as I was testing out my new GoPro. To give a rough idea, here’s a 60 second video of the finale, though if you look around the net, there are much better examples!